"A zesty treat--Goes great with bbq'd chicken and a beer. This dish has more of a Thai flavor. For a Japanese flavor, omit the pepper flakes, peanuts, and cilantro. Add 1/4 c. of toasted sesame seeds. If you're feeling adventurous mix in 1/2 c. of shredded dried seaweed (nori) just before serving. You can substitute ramen noodles for soba." In a large pot, cook soba noodles according to package directions. Drain, rinse noodles with cold water, and set aside. Pour into a large bowl the sesame oil, rice vinegar, soy sauce, and lime juice. Mix in lime zest, brown sugar, garlic, and red pepper flakes; stir until sugar dissolves. Toss in carrots, peanuts, and cilantro. 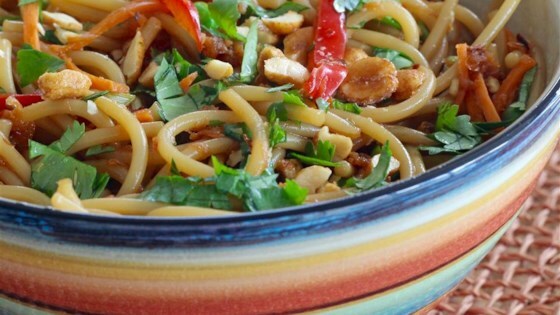 Cut noodles into 3-inch lengths. Stir into dressing mixture. Cover, and refrigerate at least 1 hour. Toss salad again before serving. If dry, splash with soy sauce and vinegar. Serve cold. See how to make a delicious cold noodle salad. This was fantastic! We loved it! Didn't change a thing. This recipe was great! Definately serve after letting the salad sit in the 'fridge overnight--more flavor! I added mandarin oranges, crushed pineapple, and baby corn to the salad, too. This salad was great. It had a fantastic flavor. I didn't use lime zest. So, it wasn't overpowering.